Interferogram, 2005–2007, by C. Wicks. 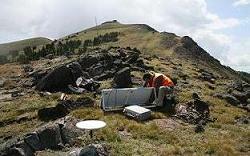 Setting up a GPS station on Mount Washburn. For information about a benchmark in Yellowstone National Park, click on a link below to search by location on a map or by name/ID in a list. The datum for the latitude/longitude coordinates is WGS84. Studies of ground uplift and subsidence at the Yellowstone caldera date from an initial leveling survey in 1923 by the U.S. Coast and Geodetic Survey. 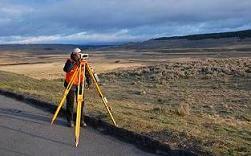 Leveling is a surveying technique used to measure elevation differences between fixed points, called benchmarks. Changes in elevation over time are measured by repeating surveys along the same set of benchmarks. 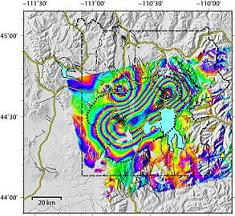 A repeat of the 1923 Yellowstone survey by the U.S. Geological Survey (USGS) and the University of Utah during 1975–77 revealed that the center of the caldera had risen more than 70 cm (28 inches) (Pelton and Smith, 1979, 1982). From 1983 to 2007, the USGS conducted 15 smaller surveys of a leveling line between Fishing Bridge and Canyon Junction, including the area near Le Hardys Rapids where the greatest uplift had occurred from 1923 to 1975–77. Recently, leveling surveys at Yellowstone have been replaced by GPS and InSAR observations (Wicks and others, 1998, 2006). There are more than 500 benchmarks in Yellowstone National Park, many of which are still used for GPS and gravity observations. Web-site design and database compilation by Megan McLay, USGS, CVO, Vancouver Wash. Address all inquiries to Dan Dzurisin (dzurisin@usgs.gov).